Are you a good singer? Or do you just like to sing? Some people can't carry a tune but they love to sing, is that you? Absolutely not,lol.But I do go to karaok with my younger sister and my boyfriend from time to time.Although they laugh at me sometimes I never get mad at them.At least I enjoy it and have fun,lol. i really love to sing and its one of my hobbies. i usually sing when there is an occasion and when i am asked to. many of my friends congratulate me for having this kind of talent. I am not good at singing. 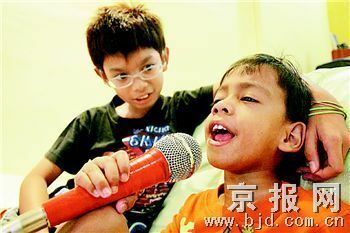 In the past I would go to sing karaoke with friends but I seldom go outside to do so any more. i am good singer, lol, but havent sung for along long time, i guess its transition time for me now, lol, anyways i do sing well and have also many times on stage and got some rewards.lol. singing apple. I am not a good singer at all, but I would like to sing with the song played on TV, raido and such. I love to sing to myself at home, not in public. I feel shy for my poor singing voice. no , not at all , i haven't tested it yet but i don't want to sing any more...but i love hearing when some one singing!!! i love singing a lot but i dont have that nice voice. i can carry a tune, just that my voice isn't really qualified to be a singer. lol. Oh, i just like to sing, but i don´t have a good voice. ^____^ But, i sing in all languages, haha, just when don´t have nobody around, hahaha. I love to sing but couldnt hold a note if you paid me. I definately wont be the next american idol, but I will continue to sing in the shower. Everyone sounds better in the shower.